Anime janai! 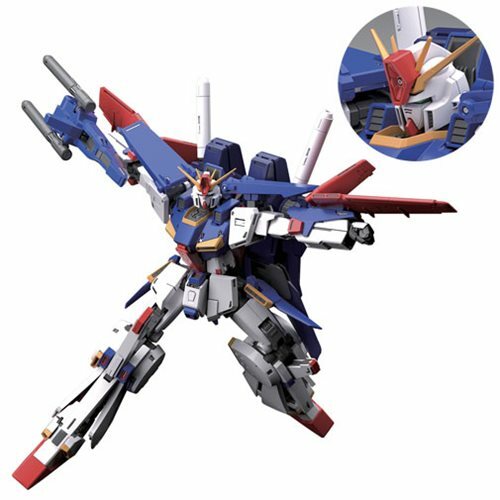 The next mobile suit to make its way to the Master Grade line-up is the ZZ Gundam Ver. Ka, as part of the 30th anniversary of ZZ Gundam! This version was designed and overseen by renown mecha designer Hajime Katoki. It is based around the elongated proportions in the Enhanced ZZ and Full Armor ZZ Gundam variants that appeared in the latter half of the anime series ZZ Gundam. The ZZ Gundam Ver. Ka Master Grade 1:100 Scale Model Kit is fully transformable! Combine the Core Base, Core top, and Core Fighter to create the G-Fortress! Mechanical detailing in the shoulders, knees, and waist utilize improved joints and sliding mechanisms for even more dynamic posing capabilities. Certain parts feature a special finish to further highlight certain aspects of the kit. Set includes 2x core fighters, multi-tube missile launchers, double beam rifle, 2x hyper beam saber, interchangeable hand parts, 17x runner, 1x water slide decal, 1x foil sheet, and instruction manual. Measures about 7-inches tall.